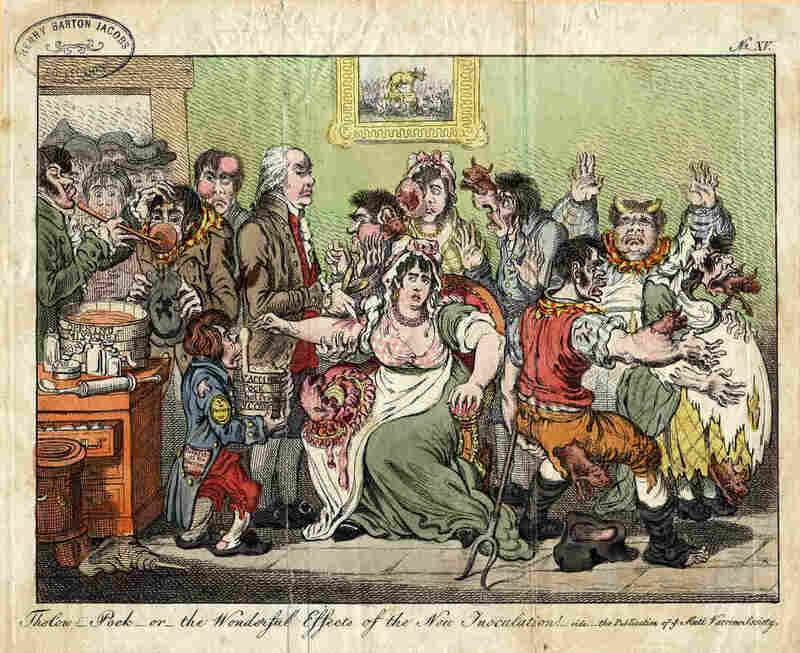 A Cow Head Will Not Erupt From Your Body If You Get A Smallpox Vaccine : Goats and Soda The eradication of smallpox was arguably one of the greatest achievements of modern medicine. But people had crazy ideas about the vaccine when it was created in 1798. A new exhibit tells the story. It all started with milkmaids. Edward Jenner, an 18th-century English country doctor, noticed that they seemed to be immune to smallpox. 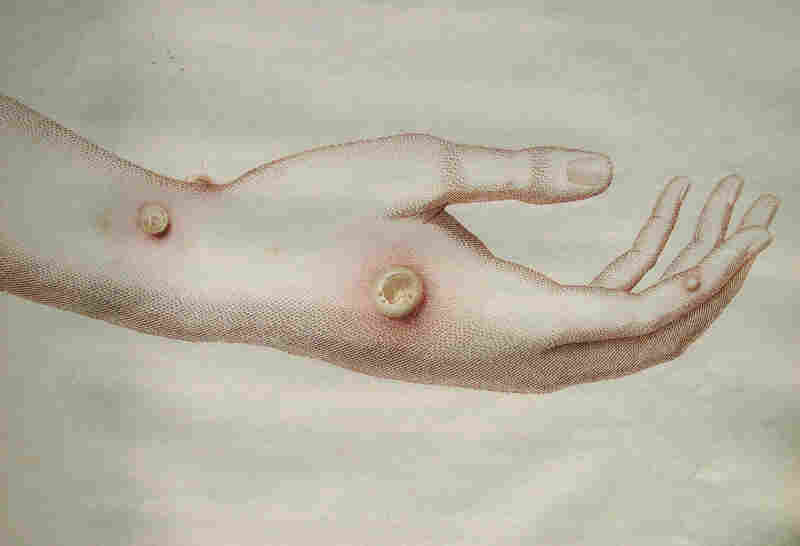 An illustration of cowpox pustules from the first edition of Edward Jenner's "An Inquiry into the Cause and Effects of the Variolae Vaccinae." And that was a time when smallpox was a truly terrifying disease. Each year, it killed hundreds of thousands of Europeans. It made people terribly sick. Its oozing blisters scarred many of its victims for life. And there was no cure. A new exhibit at Johns Hopkins University in Baltimore, open until March 1, traces the history of a disease that as late as the 1960s was still killing millions every year. Christine Ruggere is the curator of the historical collection at the Hopkins School of Medicine. Walking among the glass display cases of smallpox artifacts on the second floor of the Welch Library at the Johns Hopkins School of Medicine, she says that at the turn of the 19th century, diseases were still very mysterious. And it wasn't clear how they spread. Then Jenner had his eureka moment about milkmaids. "In English literature and poetry milkmaids are referred to for their creamy complexion, as pretty as a milkmaid," Ruggere says. "One of the reason they had such nice complexion was they didn't get smallpox." Jenner guessed that by being exposed to a bovine form of the disease, cowpox, milkmaids were protected from the much more lethal smallpox. So he set out to test his theory. "Now his experiments are not what we would do today," says Ruggere. "He took cowpox [and] gave it to a small boy. The boy got a good case of cowpox and was healed. Then he took smallpox and injected it into the same child." The 8-year-old never developed smallpox. Jenner had just come up with the world's first vaccine. His idea was widely ridiculed at the time. A cartoon from 1802, on display at this exhibit, lampoons Jenner. It shows a crazed scene in which cows' heads erupt from the bodies of people being inoculated against smallpox. So as scary as smallpox may have been, people were also terrified of this new idea of inoculation. And religious leaders said it was immoral to stop a disease that God has created. "Even today there are those who feel we should not be intruding on God's will," says Dr. D.A. Henderson. In 1966 the epidemiologist went to Geneva to head up a World Health Organization campaign to eradicate smallpox entirely. "At the beginning of the program, there were an estimated 10 million cases and 2 million deaths," he says. "The disease was present in 31 countries." 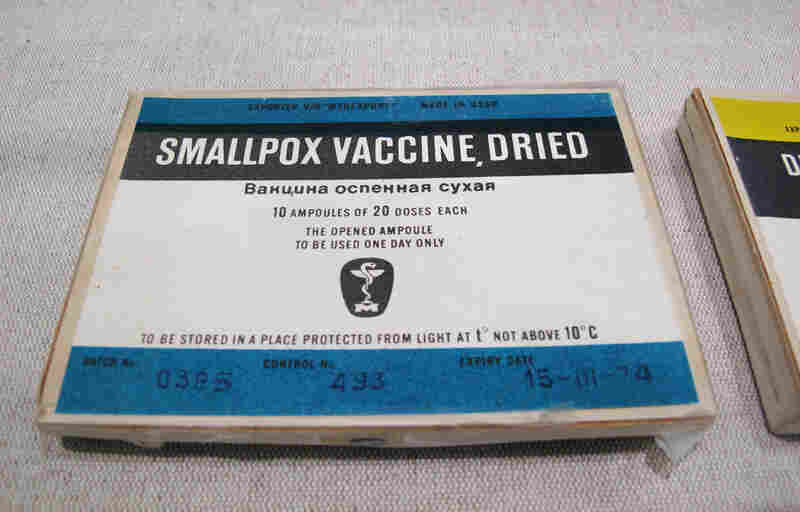 Freeze-dried smallpox vaccine produced in the Soviet Union for the WHO campaign. Each vial contains 100 doses, which could remain stable at least 30 days at 98.6 degrees Fahrenheit. That was critical if the vaccines were to be used in the tropics. The eradication campaign tracked smallpox cases, then vaccinated everyone in a geographic circle around the patient. Smallpox only travels from person to person. "If you could snip the chain, you'd stop the spread," Henderson says. By the mid-1970s Ethiopia was one of the last smallpox holdouts. It was also in the midst of a bloody Marxist revolution. Getting around was so difficult that the vaccinators had to use helicopters. "Even with the helicopters we had some troubles," Henderson recalls. "One was blown up with a hand grenade because people thought it was the Italians coming back to occupy Ethiopia. Another time they captured a helicopter and asked for ransom." Eventually the vaccinators got their helicopter back. The last case of smallpox ever recorded was on Oct. 26, 1977, in neighboring Somalia. "It's the only disease of man which we have succeeded in eradicating," Henderson says. 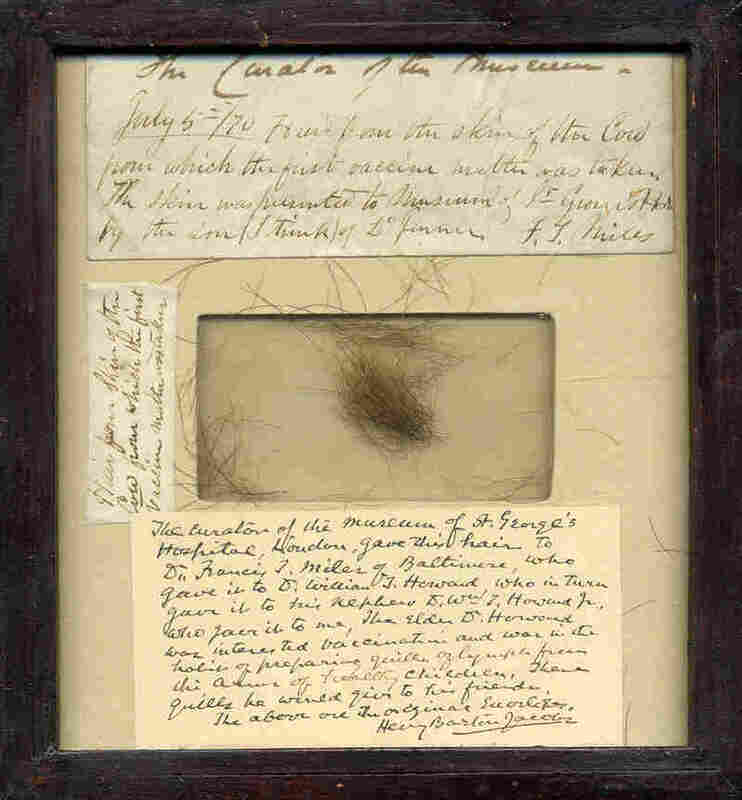 Tracking down the final smallpox cases was the hardest part of the eradication campaign. In what could be useful advice in the final push to eliminate polio, Henderson says the key was to get local leaders to embrace the cause. Ultimately, wiping out smallpox, he says, involved drinking a lot of tea.